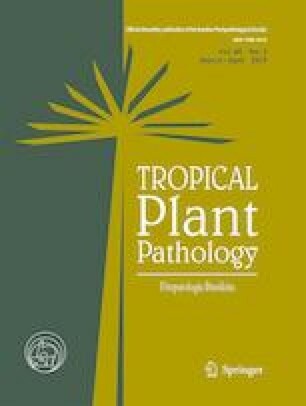 Root-knot nematodes (RKNs) are among the most economically important plant-parasitic nematodes parasitizing coffee (Coffea arabica) in the Americas, including Brazil. Meloidogyne izalcoensis is a parasite of coffee, which was first reported in El Salvador. Biochemically, the esterase phenotype is effective to differentiate M. izalcoensis from other species described from coffee. Two years ago, this nematode was detected in a sample containing coffee roots from the region of Indianópolis (Minas Gerais State, MG, Brazil). The esterase phenotype (Est I4, Rm: 0.86, 0.96, 1.24, 1.30) of this population supported the species identification of M. izalcoensis. To further confirm this identification, PCR (Polymerase Chain Reaction) using SCAR (Sequence Characterized Amplified Regions) primers amplified a specific fragment of expected size (e.g. 670 bp) typical of M. izalcoensis. Morphologically, this population was also identified as M. izalcoensis. In Minas Gerais, coffee plants were erradicated and soybean planted in the infested area. The root symptoms are completely different from other RKNs of coffee in Brazil. This is the first record of M. izalcoensis occurring on coffee in Brazil. Although the overall distribution of this species in Brazil is unknown, its occurrence on coffee would indicate a potentially important threat to the commercial cultivation of coffee, particularly in the state of Minas Gerais. This find resulted in the removal of the coffee plantation where this nematode was found.